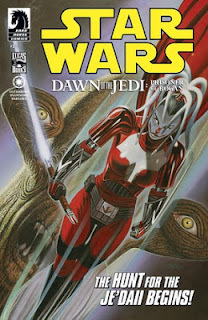 The Fellowship was fortunate enough to obtain a copy of STAR WARS: DAWN OF THE JEDI—PRISONER OF BOGAN #1 from Dark Horse Comics. John Ostrander writes, and Jan Duursema draws. Xesh is a force hound, slave to a recently killed master. Daegen Lok is an exiled Je’daii, banished for seeing something in a vision, believed mad. They meet on the abandoned moon Bogan, where they’ve both been left by the Je’daii. Things are happening around them, but they aren’t planning on staying where they’ve been dumped. This is a story set thousands of years before the films, in the early days before the Jedi Order. But it’s still space opera in top form. There’s plenty of lofty goals, loftier speech and Force users of many different kinds blending together in a story worthy of legend. Ostrander and Duursema are at their best in this one. It certainly seems hard to go wrong with the Star Wars franchise, and Dark Horse has got another epic tale for us right here. I’m really looking forward to this one. STAR WARS: DAWN OF THE JEDI—PRISONER OF BOGAN #1 is available now at your FLCS or by order from darkhorse.com.